This is a super easy craft that looks way fancier when lit up. I love saving jars. I do not like Mason or Ball jars because you have that lettering on them that really makes it hard to use. So I save jars, all kinds from jam to salsa. 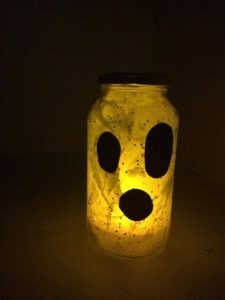 For this craft I used a jam jar, but any size will work. FIRST STEP!!! you must remove all labels from jar before use click here for my step by step on removing labels. I felt a graveyard was fitting for my jar. For inspiration I went online a looked up a few ideas. I drew on my black paper a bird, few tombstones, a hill and a tree. 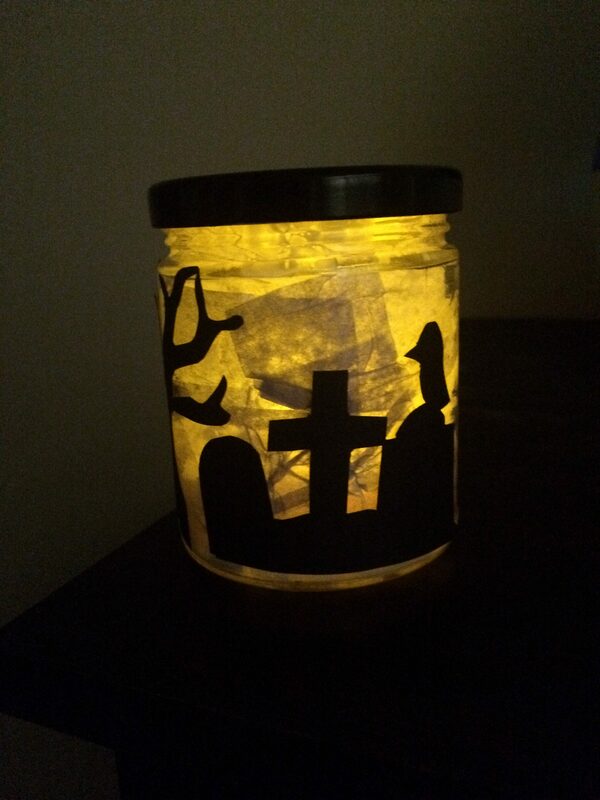 I am sure if you had one of those fancy paper cutting machines you could do a neater design, cough Christmas gift :)) I cut out squares of tissue paper and then took my Mod Podge and glued them inside the jar. While it dried I applied my graveyard scene with my glue stick. I flipped my images when gluing so you cannot see my pencil lines. Once it is completely dry then pop in your tea light! You can do many variations of this craft here is a ghost I made.